Seeing as you're all model engineers, and capable of imagining that part hidden in a lump of metal...here's the beginning of my shop. It's that section with the two windows towards the left. It measures about 13 1/2' by 20'. The windows are too high and will be dropped a bit. The 'room' to the right with the door will be a utility room (washer/dryer and storage). Just outside of the shop will be the sink from the kitchen that's also being remodeled. The wonderful thing about the sink is that it has a hot water butler. Hot coffee will always be available. Supposedly, things are scheduled to be complete by early May (weather permitting and all that). As soon as the floor is in I'll be able to start setting up. I went with vinyl squares (not the stick on) over the concrete. The left wall has no windows. There's nothing to see but my neighbor's house and I wanted wall space. The back windows look out over the backyard and boy do I look forward to that. I'm pretty well set on the Grizzly G0759 mill that comes with a stand and DRO. My initial thought on the lathe is the G0752. This is where (as in many elsewheres) I could use your thoughts and advice. I haven't decided to buy a stand or build a bench. I haven't looked yet to see what accessories (primarily a QC) is available. I'm also noodling on a name for my little world. Zee's Shop (and Zee's World) just doesn't cut it. Knowing you people I fear to ask for suggestions...so at least keep it clean. My grand-daughter will be one of the first visitors. 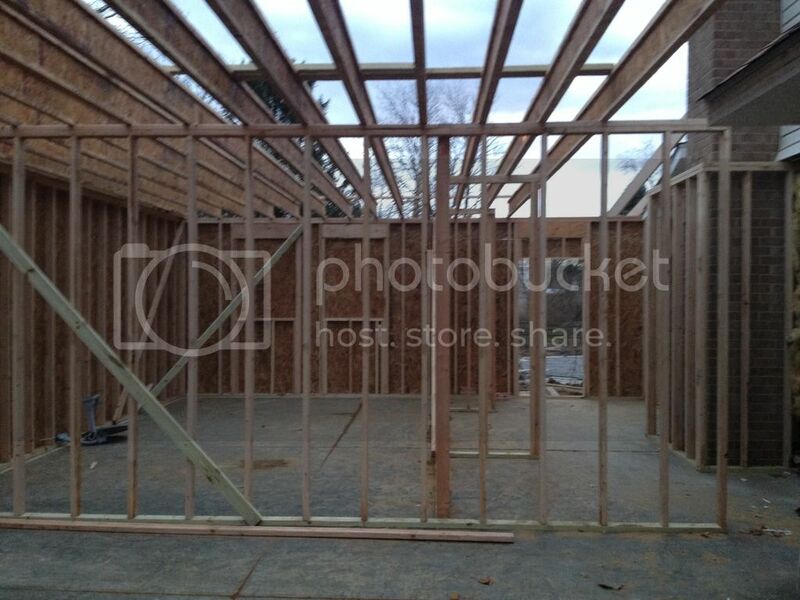 Bet you are one happy camper with the new shop started! Is Mrs's Zee happy with her new rooms too? Shops can almost never be too big...you just gotta pay for them! As for a name.....Cletus will chime in soon! Great beginnings Zee!! Good to see you back as well. I will hope the weather holds out for you and the renovations. That's going to be a great new shop Zee! Machinery wise have you looked at any of the Precision Matthews equipment? http://www.machinetoolonline.com/NewlatheIndex.html It seems to get good reviews and it sounds like they're helpful folks to work with. Are you going to have any 220 volt power ran to your shop? Might come in handy at some point. Why is it taking until May: That should be a 6 week job.. The Precision Matthews equipment looks pretty good. I gave it serious consideration before I ended up with my Grizzly. I think they are basically the same equipment as Grizzly gets, and very similar quality. I have heard inconsistent reviews of customer support. Some people say its been great, others say its pretty spotty. They are very nice people, if you can get a hold of them. And the owner is (reportedly) very knowledgeable on his product lines. But he's a busy guy and has a lot of people to support, so sometimes getting a hold of him seems to be the biggest issue. I've never had a problem getting a hold of Grizzly support, and have found them to be very knowledgeable and helpful. So, customer support is probably a toss-up here, maybe a little toward Grizzly since I think they have more people supporting their lines. Also, availability seems to be difficult sometimes. Some people report waiting many months for an order they have placed, and some get theirs quickly. I'm sure its because he orders the machines in batches, but can't afford to keep a very deep stock. So, if you're lucky, they have one in stock. But usually, you have to wait for the next shipment, which could be several months out. Availability, Grizzly has the edge, but this is a short term issue. If they have what you want in stock, or if you're willing to wait, this isn't an issue. For me, the thing that finally tipped the balance toward Grizzly was that I have more confidence that Grizzly will still be around in 10 years to support my machine. PM might be around, and it might not. Its one guy (a good, honest fellow, from all accounts) who batch orders machines from China, and will provide you support. That's how I ended up with Grizzly over PM. But I think they are both quite good machines. Oh, and I agree with Jim. Make sure you get some 220 put in. And LOTS of 110v sockets everywhere. You can't have too many power outlets. My shop is a bit shorter than yours. At present lots of space but now that I bought about 1000lb of steel and Al from an estate it is starting to feel smaller. Don't be too quick to lower those windows, it might interfere with counter space or shelving above a workbench. I have a G0602 equivalent, aka the non-variable speed version. Go for the variable speed, you won't regret the flexibility it gives to change speeds while cutting. Some will no doubt pipe up to say 'get a full gearbox' but I don't find changing the gears for threading too onerous. There is a calculator from Windows for the G0602 that gives alternate gearing, and there are some charts as well. These can lead you to leave gears in, or picks ones, that require fewer changes for your threading needs. As for the bench, the advantage of the purpose built is that it is one less thing for you to build :-) It will make for a solid platform with leveling feet included. I had to build my own bench and I am finding it a bit lacking in rigidity but it will have to do. Your lights should be 110v LED tubes, no heat generation and no buzzing. Also l low power needs. I put 2 quad boxes on the wall behind my lathe/mill bench, you can't have too many plug points. This leaves me space to plug in lights, small compressor for coolant mister, machines, tool post grinder etc. On the surface with conduit will let you rejig when/if needed. Digging into drywall is not fun after the fact. Name, how about 'New Zeeland', since it is your new shop? I looked at the machine you mentioned Jim. It does look similar. A bit more expensive and more freight than Grizzly. I think Kim has some good points about support. I thought it interesting that the Grizzly machine is available on Amazon. As for 220V...I can't imagine any need for it. Bigger machines, welding, etc. are not in my plans. However, the dryer is right on the other side of the wall which means 220V is nearby. I'll ask the electrician about it. Did I mention we're going solar? "Zee Zone"...best I've heard so far. Hey I could use your help here Marv. Something German would be wunderbar. (I think zone is the same in German). A pretty big expense but this is what we've saved for. It's about nesting for retirement and being able to stay here as long as possible and not having to burden our kids. Gerrit - thanks. Good to know about the bench. And yes...LED lighting. Chris - no. That would confuse our friends in a number of countries. Don - surprised you didn't suggest Zee's Tu-Tu Shop. As of today...far side is dining room, then kitchen, and I'm standing in family room. All of which gets bumped out 8'. 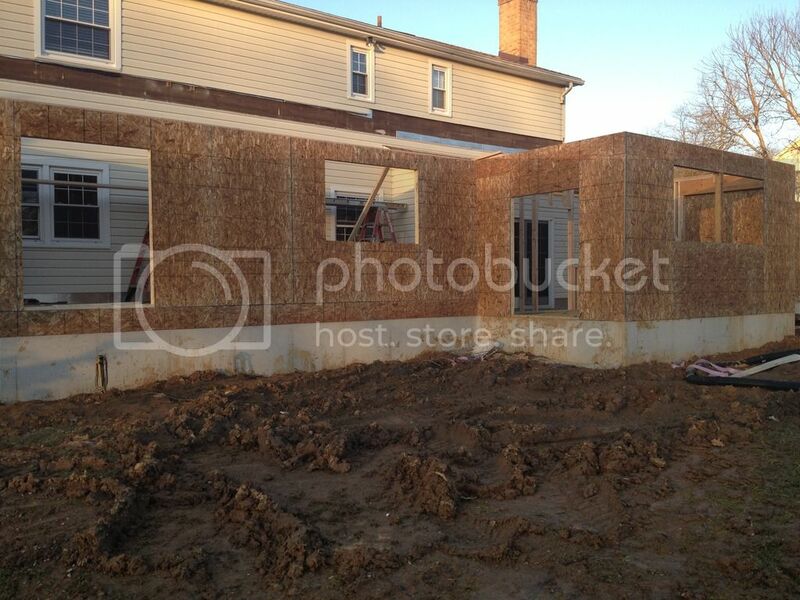 As of yesterday...the backside of the house. 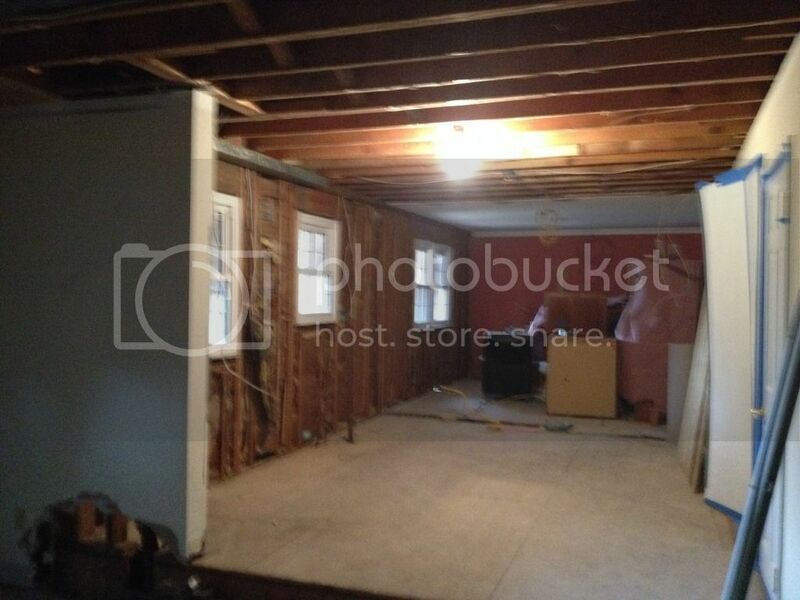 Left to right is dining room (getting turned into T's 'shop'), kitchen, and family room with sun porch). Hey bud,where are the dancing piccys you promised? Come on man let's see them! Wait, where is the Shop Elf's bedroom?! Good to see you back, Zee. The shop is going to be nice.
" Zee's Schnitzelhaus und Machinengeschaft"
I have no elves. Unlike you, I do not provide mint chocolate chip cookies. I haven't come up with something to entice them in. Truth be told, I think they're afraid of what they see here. Close. But Schnitzelhaus is in T's shop. No way am I going to compete with her. "Zee's Machinengeschaft" could work although it's not quite generic enough. I don't intend to just do machining. Oops. That may come across a bit blasphemous.